Does yours? 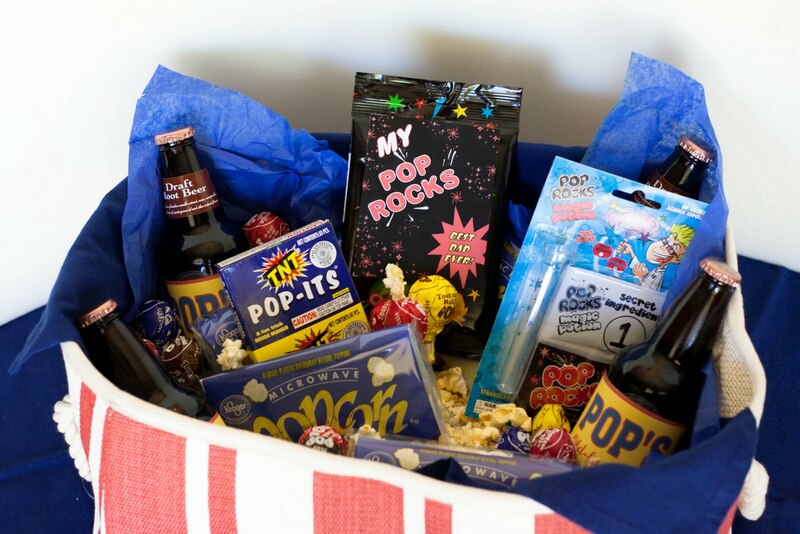 Then tell him with a poppin’ gift basket! This is my final Father’s Day idea post this year, but you still have time to throw this one together, if you hurry. I wanted to find a “pop-up” hamper or basket to put it all in. This basket came from Cost Plus World Market a while back, and is close enough. The centerpiece of the basket should be the Pop Rocks, since that is the theme! I have attached my printable file for you below. You may not be able to see it all that well, but I used popcorn as the filler for the basket. If you can use air popped popcorn without the butter that would probably be the least messy (not that that’s what I did). Any soda “pop” would work, but I think a lot of dad’s like root beer, and there is a root beer that is actually called “Dad’s Root Beer,” So I designed a label (again you can download it below) that mimics the design of the Dad’s brand label, but instead says, “Pop’s” in keeping with the theme. Then I just attached it to the bottles I had purchased (any brand will work.). 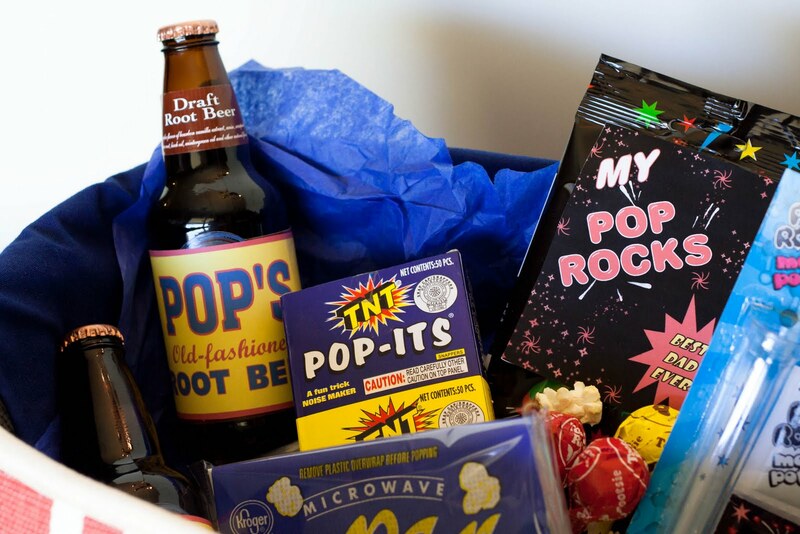 For other “pop” ideas (like pop-tarts, and popsicles), check out the baby shower. You could adapt anything. 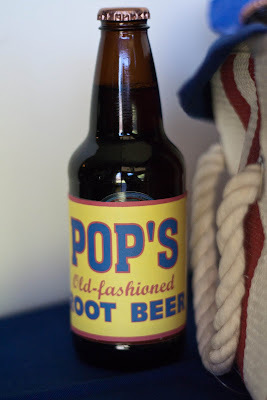 And really, what dad doesn’t like root beer, popcorn and some fun reminiscent of his childhood years? Aren’t most grown men just little boys in big bodies? Label Downloads for you here. I’d love to hear from you if you use any of these ideas! You can upload photos on the Facebook page, or shoot me an email. Awesome idea! I tried to download the link and it wasn't working. Is it me? Sorry about that, Steph! I don't know what was going on. You should be able to get them now! Super fun idea. Wish I had found you sooner. Thank you so much for this awesome idea! I know father's day was a few weeks ago, but I'm posting about it on my blog now, and I just remembered I hadn't thanked you! My hubby loved it! (as did my 3-year-old!) 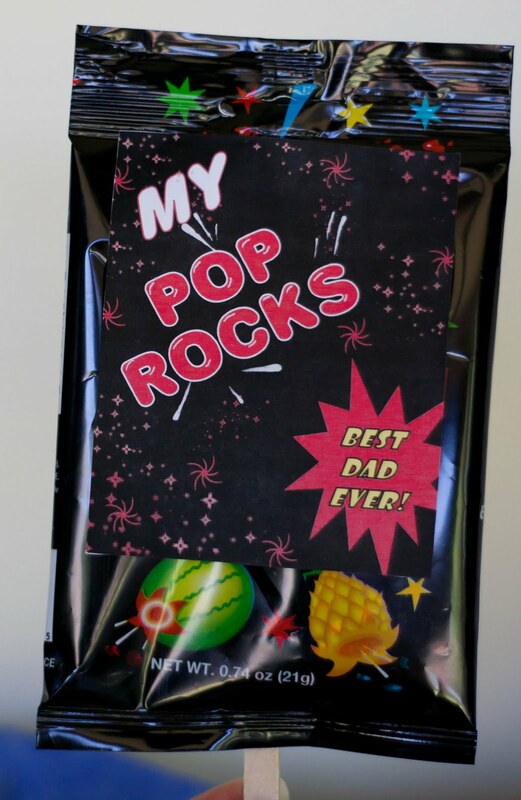 It was super last minute for me, and I was so bummed I couldn't find pop-rocks! O-well, now I have some awesome ideas for next year! Thanks again! I really want to access the downloads, but there doesn’t seem to even be a link on the webpage. How can I access them? The downloads are showing up fine for me. Maybe you need a Scribd account to access them? What web browser are you using? Is anyone else having trouble with them?